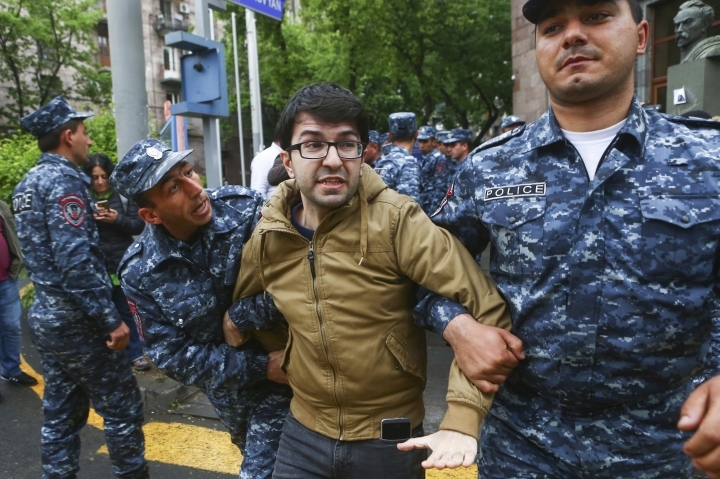 YEREVAN, Armenia — Armenian authorities say more than 70 people have been arrested, including two people suspected of building bombs, as large protests against the new government enter their second week in the capital. Thousands of demonstrators on Saturday closed off streets in Yerevan during a march pressing demands for the prime minister to resign. Former President Serzh Sargsyan was named premier this week as Armenia transitioned to a new system of government that reduces the presidency's power and bolsters the prime minister role. Opponents say the shift effectively makes Sargsyan Armenia's leader for life. The national security service said two people with opposition connections were arrested for preparing bombings in public places. Police, meanwhile, said at least 70 demonstrators were detained.